Line a 9-inch (23-cm) square metal baking pan with plastic wrap, allowing it to overhang about 4 inches (10 cm) on 2 opposite sides. Smooth the plastic wrap so that it fits the contours of the pan and is as even as possible. Using a rubber spatula, spread the ice cream into the prepared pan, pressing it in as smoothly and evenly as possibly. Fold the overhanging plastic wrap over the ice cream, then wrap the pan securely with more plastic wrap. Freeze until firm, at least 2 to 3 hours. Line a baking sheet with parchment paper. Remove the pan from the freezer and unwrap the outer layer of plastic wrap. Using the overhanging plastic wrap, lift the entire slab of ice cream out of the pan and place it on a cutting board. Grab a long, sturdy knife and cut the ice cream into 8 equal rectangles. Use a metal spatula to separate the rectangles and transfer them to the prepared baking sheet, spacing them at least 2 inches (5 cm) apart. Insert a craft stick into one short side of each rectangle. Cover the baking sheet with plastic wrap and freeze until firm, at least 2 to 3 hours. In a heatproof bowl, combine the chocolate and oil. Place over but not touching a pan of barely simmering water and heat, stirring gently, until the chocolate melts and the mixture is smooth. Remove from the heat and let cool, stirring occasionally, until the mixture is barely lukewarm, 15 to 30 minutes. Place the toppings of your choice into separate bowls. Remove the ice cream bars from the freezer. Working quickly, lift up 1 bar by its stick. Dip the ice cream bar into the chocolate, covering the ice cream partially and letting any excess chocolate drip back into the bowl. Sprinkle with the topping. Return the bar to the baking sheet. Repeat with the remaining ice cream bars. 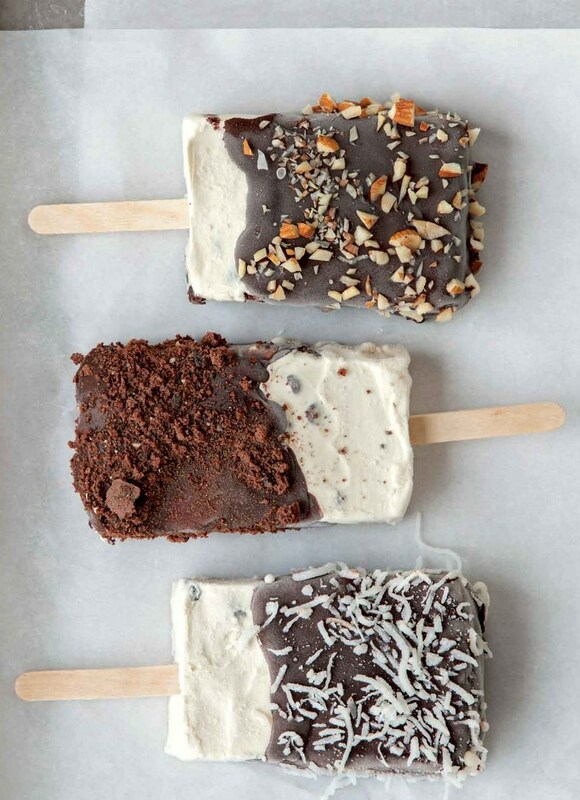 Freeze the ice cream bars, uncovered, until the ice cream and coating are firm, at least 2 to 3 hours. Consume immediately with great glee or, for longer storage, wrap each bar individually in plastic wrap and return them to the freezer.